Regardless if you are a hiker, biker or runner, you need stretches for runners if you use your legs a lot! I encourage you to use the meditation techniques below, to stretch the piriformis, IT band, iliopsoas, quadriceps and hamstrings. I have known a lot of runners over my life and have come to understand why stretches for runners are so important. Runners have chronically tense muscles of the legs: Iliotibial bands (IT bands), quadriceps, hamstrings and the iliopsoas muscles (hip flexors). Since I do a lot of hiking, my iliopsoas muscles (hip flexors) and IT bands present issues for me as well. The muscles of my hips and legs that bring me discomfort do so because of the emotional issues that these muscles represent. I store a lot of my emotional energy in my hips, as a lot people do, especially women. My Body Window speaks a lot to me through the muscles of moving forward. I discuss my personal issues more in the articles on foam rolling and exercises for the iliopsoas. Add exercise strain to muscles and tissues that already embody our stress, and a formula for problems is created. Anyone who uses their legs in any activity to power themselves forward will eventually have problems with the muscles described in this article. If a person combines the running stretches in the video with foam rolling of the legs, especially the Iliotibial band (IT band), he/she may find relief from chronically tense legs and hips. Tight IT bands are one of the leading causes of lateral knee pain in runners, cyclists, hikers, and weight lifters who do a lot of squats. I put this short meditative video together for those who wish to reconnect with their body-mind-soul while doing their exercise stretches for runners. The exercise stretches in the video, below, work on the iliopsoas muscles (hip flexors), the hamstrings, quadriceps, and to a smaller extent the IT Band. Always remember to breathe slowly and deeply and really feel these stretches for runners. Make the movements meditative by focusing deeply on your breath. As you breath in, soften the body, and as you exhale, go a little deeper into the stretch. Hold each posture for as long as your intuition wants. Don’t forget to stretch both sides. If the final stretch in the video hurts your knee, use a soft towel under your knee if your yoga pad isn’t soft enough. Let your Body Window speak to you as you listen to the issues you have with tight muscles of the legs and hips. *Music by William Coulter, "The Painter and the Magician." You may follow-up with other yoga stretches that are also very good running stretches. The Pigeon Pose stretches the IT band and the piriformis and opens tight hips. There are more benefits of yoga, so starting a yoga practice would help heal your entire body-mind-soul. The Plow Pose and the Seated Forward Bend Pose stretches the hamstrings and the iliopsoas. For a more gentle stretch of the iliopsoas, quadriceps and hips, use the Child's Pose. Use this pose if your hips are too tight to do the Pigeon Pose. The Modified Pigeon Pose and the Half Spinal Twist Pose stretches the quadriceps and the IT band and piriformis. 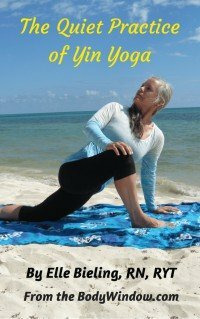 These yoga stretches are all great stretches for runners, hikers, bikers and everyone who uses their legs alot! In addition, just about every yoga standing pose will stretch one or several parts of the legs and hips. 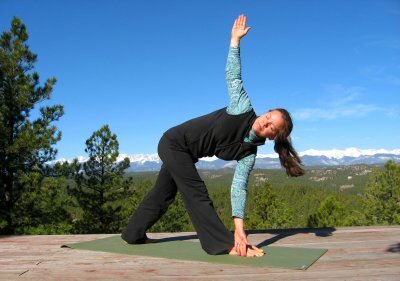 The twisting poses are especially good for the iliotibial band (IT band), especially the Revolved Triangle Pose, below. Please see Foam Roller Exercises for the IT Band and TFL for more intense IT Band exercises and stretches. Also see Foam Rolling for a list of more foam rolling exercises and stretches for specific hip muscles, like the piriformis, iliopsoas and hip adductors. May it be so that your journey to wholeness is enhanced by doing these yoga stretches for runners! May your body, mind and soul experience it's reintegration into total health and well-being!